Built in 1956, the Elizabeth McLean Residence is situated on 1.3 acres in the Benjamin Hills Estates, which had been the 138 acres farm purchased by Benjamin F. McLean in 1908. In 1953, the city of Wichita incorporated part of the original McLean farmstead into the city limit. Benjamin's daughter-in-law Elizabeth served as executor of the 138 acres and elected to plat the area and sell the lots for development. Elizabeth commissioned architect Glenn E. Benedick to design her split-level Ranch house. She worked closely with Benedick to add her personal touches to the final design of the property including the choice of exterior and interior materials and the fleur-de-lis sunken garden. The home's exterior is faced with Etowah pink marble quarried from the Georgia Marble Company in Tate, Georgia. The property is nominated for its significance as an architect-designed 1950s split-level Ranch house. The Mentholatum Company Building is a one-story Mission/Spanish Colonial Revival building, constructed of reinforced concrete. The building's exterior is rendered in stucco and originally was painted white with mint green trim, the colors of the Mentholatum products. It is nominated for its association with A. A. Hyde, who founded the internationally known company. It is also significant for its association with the prominent Wichita architect, U. G. Charles and built by the Wurster Construction Company in 1908. Erected in 1913 by Joseph Wapelhorst, the Mohr Barn is a two-and-one-half story, balloon-frame barn. The interior of the barn is a variation of the Midwest Three Portal barn floor plan as described by Allen G. Noble and Richard K. Cleek. Its most unusual feature is a spiral staircase. 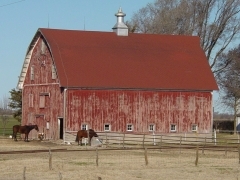 The barn is nominated in the area of history for its association with the farming practices of the German immigrants who settled in Sedgwick County and as an architectural example of a board-and-batten, balloon-frame, gambrel-roof barn. 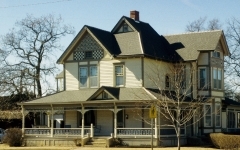 The Monroe-Mahan House was nominated for it association with Wichita leaders Reverend James Monroe, John Mahan, and Silas Dague, and as the last remaining Queen Anne home from the once residential, now commercial, area of South Broadway in Wichita. Monroe built the home in 1887 while he was minister at South Lawrence Christian Church, the forerunner of the current Broadway Christian Church. Mahan purchased the home in 1897. Mahan owned the saloon inside the Carey Hotel that temperance movement leader Carrie A. Nation vandalized on December 26, 1900. Mahan and his brother signed the complaint that put Nation in jail. Mahan and Nation would go on to clash on two more occasions. Arthur Pauline, a commission broker and owner of the Pauline Commission Company, bought the house in 1902. After Pauline's death, his widow married Silas R. Dague who moved into the residence. Dague was the owner of the Dague Business University and an inventor. J.B. Muller and J.C. Lamb erected the Mullen Court Apartments, located near downtown Wichita, for apartment developer/manager Mrs. Eva Mercer Gilham in 1949. 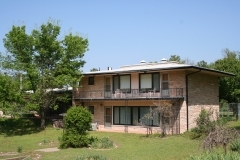 The building was built in response to the post-war housing shortage in Wichita and offered residents studio and one-bedroom options. The Mullen Court Apartments were substantial in comparison to many of the other apartments constructed within the Topeka-Emporia Blocks, which had mostly single dwelling houses at the time of construction. The building was nominated for its architecture as an example of Moderne design with its simple brickwork and its interior integrity that includes multi-light French Doors. 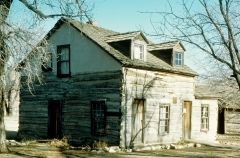 Constructed in 1868 of hand-hewn logs with buffalo hair and willow branch plaster, the Darius Sales Munger House is credited as being the earliest surviving house in Wichita. Built by Munger, a founder of Wichita, it is a two-story house with seven bedrooms, a wood shingle roof, and two brick chimneys. The building is also credited as being Wichita's first post office, hospital, hotel, hall of justice, and community center. It was nominated for its association with Munger. Located in College Hill neighborhood, the Newbern-Gore House was built in 1927 and is a two-story American Foursquare with Craftsman and Prairie design elements. A typical Foursquare is two stories, two rooms wide and two rooms deep, with a low-pitched roof. The features and details borrow from the Prairie and Craftsman styles, such as wide, overhanging eaves, square or tapered porch supports, full-length front porches, and horizontal groupings of windows. This property includes an original detached garage and a modern non-contributing detached garage. The house is named for two owners: Reymond Newbern and Harry Gore. Newbern was secretary of Wichison Natural Gas Company and then became president of Northwestern Natural Gas in 1931. He sold the property on Roosevelt Street to Harry Gore in 1930. Gore moved to Wichita in 1925 and remained active in the oil business until his death in 1951. Architect: Graham, J. I. (builder) Shirk, Oscar S.
The North Market Street Apartments Historic District encompasses a cluster of three multi-family purpose-built apartment buildings. Proximity to streetcar lines and easy access to Wichita's commercial and industrial districts made the neighborhood around North Market and Pine Streets a desirable residential area. Built in 1914, the two-story Kerbaugh Apartments at 730 North Market was among the earliest multi-family dwellings in the neighborhood. Real estate developer Oscar Shirk constructed the building, which began as a duplex of stacked-flat apartments, but was converted to twelve apartment units in 1929. 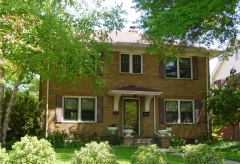 It features Tudor Revival detailing. The Jayhawk and Alcoba Apartments, located at 722 and 718 respectively, were built in 1929 by J. I. Graham and included nearly identical floor plans with twelve one-bedroom apartments. 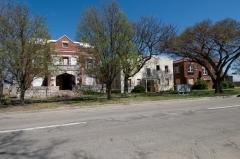 The Alcoba exhibits the characteristics of the popular early 20th century Spanish Colonial Revival style and is identical to the National Register-listed Fairmount Apartments in Wichita. The Jayhawk features simple Colonial Revival detailing with minimal ornamentation. The small district was nominated as part of the "Residential Resources of Wichita, 1870-1957" multiple property listing for its architectural significance. Acquired in 1897, the 30-acre North Riverside Park had experienced some development prior to the onset of the Great Depression, with the most notable feature being the Park Villa shelter house. The Park Villa shelter encouraged families to visit, but there were no restroom facilities for use within the park. 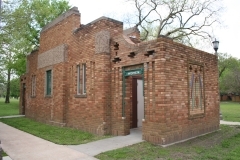 Lewis William Clapp, President of the Board of Park Commission, designed the comfort station, which was constructed as a Civil Works Administration project in 1934. It represented the first new construction in a city park to be federally funded by New Deal workers. The comfort station is an excellent example of the Art Deco style as applied to a utilitarian park building. It is significant for its high artistic values evidenced on a small scale, and as a type of construction - Carthalite - that originated in Wichita. Carthalite was a local trade name for a mixture of concrete mortar mixed with crushed glass and pigmentation. The building was nominated for its architecture and for its association with New Deal-era government projects.